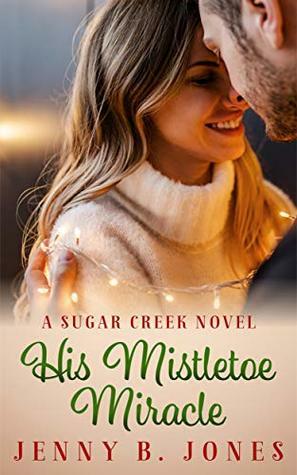 His Mistletoe Miracle (2018) by Jenny B. Jones is the third book in her Sugar Creek Novel series. This book comes in eBook form, and is 200 pages in length. With a full-time job and a very busy six-year old at home, this novel took me less than one day to read. I purchased this novel from Amazon on December 13, 2018 in order to review. In no way has this influenced my opinion of the book. All opinions expressed in this review are my own. I give this novel 5+++++ STARS. His Mistletoe Miracle is a Contemporary Inspirational Romance. He needs a fake girlfriend. She needs a holiday miracle. After years as a hostage in Afghanistan, wounded journalist Will Sinclair retreats to idyllic Sugar Creek, Arkansas, to finish his memoir and get his life back on track. As if the town’s match-making mamas aren’t enough trouble, his own meddling family descends on him for the holidays. To get them all off his back, Will plots a ridiculous idea. He just needs the right woman. When he finds a bossy decorator in his yard, it’s more than her ugly Christmas sweater that makes her the perfect pick. Cordelia Daring loves her life as a foster mom and entrepreneur. But when she finds herself in need of money, Will’s offer comes just in time. Pretend to be his girlfriend for two weeks? She can handle that. Sure, she flunked drama in high school, but how hard could it be to pose as the arm candy of famous journalist Will Sinclair? Never mind that her foster son adores him. Or that his family is everything she’s ever wanted. Because when the deal expires, Cordelia intends to take her money and run. As the holiday draws near, their pretend relationship spirals out of control. And Cordelia’s not sure she wants it to unravel. If these two hope to make it till December 25th, they’re going to need some serious Christmas magic. . . If you like heart-warming characters, small-town romance, and laugh-out-loud moments, you’ll love this visit back to Sugar Creek. His Mistletoe Miracle is one of the BEST books I’ve ever read hands down! I laughed so hard. I cried like a baby. And, I even felt a little weak in the knees a couple of times. This is one of those books where I stopped to re-read passages to my husband because I loved the moments so much I wanted him to love the moments, too. I love when I want to do that with a book! The fake girlfriend/boyfriend plot is one of my most favorite tropes ever, and Jenny B. Jones does this plot line perfectly. From the negotiation meeting all the way to the final page, Cordelia and Will’s relationship is a pure delight to read. The wit and sarcasm flying between the two is written so well I was in tears laughing so hard. Cordelia and Will have superb chemistry. I adore their friendship. These two are not afraid to tell each other real truth. They become the voice of reason to one another and say the things that need to be said exactly when things need to be said. I also very much enjoyed watching as their relationship bloomed into one of love and respect. Jenny B. Jones crafted a seriously excellent partnership in this novel. His Mistletoe Miracle was a cathartic read for me that I didn’t even know I needed. I related so much to Will and his issues. Will is a very well-written traumatized character. It’s been 9 months since Will was rescued from a prison/torture cell in Afghanistan. Instead of dealing with his issues, Will would rather run and hide. He knows he needs to move on, but how does one do that when guilt and pain and fear are constant companions? When Will meets Cordelia he is instantly drawn to her joy, sweetness, and security. He almost takes over her days because he craves the freedom he feels when he is with her. Being with Cordelia means a reprieve from the constant aftereffects of his trauma. But, all he is really doing is hiding. He’s hiding from his truth, from his loving and concerned family, and from his future. When things sort of blow up between him and Cordelia, Will feels at his lowest. On Christmas Eve, Will finds himself collapsed in front of the very used and old Nativity set in front of his church and cries out to God. He can’t handle the pain anymore. I balled my eyeballs out. I needed this reminder SO badly this Christmas season. Life has been extremely painful since April 2017. Every time I turn around another shoe has dropped. I’ve been praying to God. I’ve been studying His Word. I think I have been giving Him all my pain, but the truth is I’ve been hiding just like Will. I have been giving God just enough, but not all. Reading His Mistletoe Miracle has shown me that I am tired of carrying my pain. I am tired of the pain caused by my dear friend Tim’s unexpected death this past June. I am tired of the pain of watching my best friend Lara scared as she battles a cancer that’s holding on to her so strongly. I am tired of being angry because God has’t healed her yet. I am tired of the pain that comes when people tell me that God allows all things for a reason. I’m tired of doubting my faith because of all this pain. I’m tired of being scared of losing my best friend. If I lose her to this cancer, I will have lost both of my best friends. It has been so hard losing Tim’s guidance, wisdom, love, and laughter, how do I lose Lara’s too? How does one go from being the three amigos to being just one amigo? And, I’m so tired of my physical pain. I’m not very functional most days, and it scares me. What am I supposed to do? Well, like Will I am supposed to really go to God. I am supposed to bare my soul and hide nothing. He already knows how I’m feeling anyway, so why hide? Instead, I need to lean into Him and let Him help me. This reminder alone makes His Mistletoe Miracle a must read for 2018! His Mistletoe Miracle is a wonderful story. I am so glad that I took the opportunity to read this fantastic book. I was highly entertained, completely engaged, and reminded that I need to stop dwelling in and on my pain and take it to the only One who can heal me. If you need a beautiful Christmas novel to escape into this holiday season, I implore you to purchase a copy of His Mistletoe Miracle. It’s a truly lovely book that has left this reader with a smile on her face and a little extra hope in her wounded heart. I’ve read several of Jenny B. Jones’s books, including A Sugar Creek Christmas, but not the other books in this series. (The characters don’t sound familiar to me.) Will I enjoy this one more if I wait and read the other books in the series first? I hope you can. I loved this one!